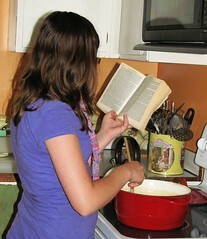 Yes, she really was reading and stirring! When I began preparing this post on summer reading contests, I came across an article about the potential negative effects of incentive-based reading programs: A Closer Look at Reading Incentive Programs (click the link to read the article). I think the article brings up some points that are worth considering. I am still going to post the links to summer reading programs because my children will read this summer regardless of incentives, and I think there are many children who love to read and would have fun with these programs. As always, use your discretion as to the types of websites you allow your children to visit, the programs themselves, book choices, and whether you think an incentive-based program might be detrimental for your reader(s). Scholastic Summer Challenge: Kids ages 7 and up sign up for their school and log their reading minutes. Schools that log the most minutes will be published in the 2011 edition Scholastic Book of World Records. There is a check box for homeschoolers. This is an interactive site, although there are strict privacy rules in place. Kids are placed in groups by book genre interest and can make a profile and interact on message boards, take polls, etc. Barnes & Noble Summer Reading: Children in grades 1-6 download a Summer Reading Journal to keep track of the books they read and record their favorite parts. Return the completed form (8 books) to a local Barnes & Noble for a free book by 9/7/10 (books are pre-selected by age and based on local availability). 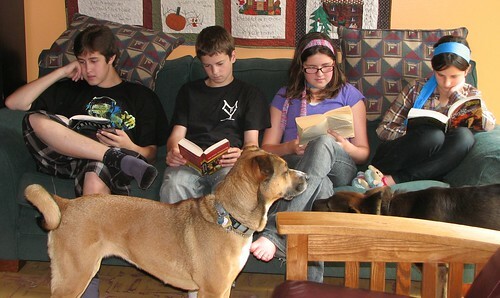 Homeschool Buyer's Co-op: You must be a member (free) for your children to participate in this summer reading contest for homeschoolers. Parents log their kids' reading hours, book titles, and optional reviews every day at the Daily Reading Record. The Reading Champions page lists everyone's reading hours, book titles, and reviews, which is nice for kids who are looking for book ideas. Every Tuesday starting on June 8, they will do a drawing for a $15 Amazon gift certificate. In September, they will do a drawing for an Apple iPad. Homeschooled children ages 1 through 18 may participate. Book It! Summer Reading: Children who were in grades K-6 during the 2009-2010 school year may fill out an entry form and mail it in after reading 5 books for a chance to win a prize package. Homeschooled students are eligible to participate (I checked via e-mail). Entries must be received by 8/23/10. Don't forget to check your local libraries, stores, and restaurants. Most libraries offer summer reading programs, and it can't hurt to keep an eye open at other public places you frequent.